Woohoo! I finished my Mom’s Quilt top! This is a king size cornerstones quilt from Eleanor Burns “Still Stripping” book. I added the inner and outer borders today, to complete the top. It was quite a monster to wrestle around. It’s approximately 115″ square. Next, I will have to iron the backing fabric, and sew up an even more monstrous back. That will have to wait for another day! Lots of great space for quilting…I’m still finalizing my plans for that. Please Dear Lord, let me do a good job on it. I also got a couple of very special rail fence blocks done today, and will get those out in the mail tomorrow for a dear online friend who is battling cancer. I feel like I have done some work today. Whew! 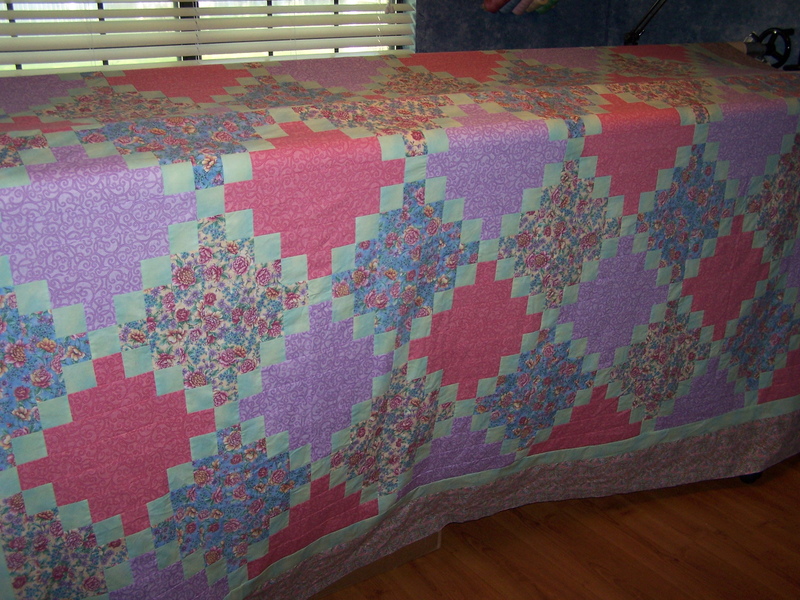 Love it can’t wait to see your gorgeous quilting that will really make it sing…. Looks great Randi, I too look forward too seeing your quilting on this one. Thank y’all! I’m thinking something leafy for the quilting…leafy wreaths, maybe CC in the chain. That’s really pretty and it will showcase your beautiful quilting very well! It is so so pretty and feminine. Can’t wait to see it quilted! Randi, it is lovely and I bet your quilting is going to be wonderful (you have talent girlfriend!!!). 😀 Can’t wait to see what you decide to do and I love your new (to me) blog! Randi, I am sure you will connect with your quilting goddess within and it will be goreous. It already is for that matter. I’m glad you had a good weekend. Thanks again, everyone! I do hope you guys are right! I think I’m ready to tackle it, but I’ve thought that before, only to hit some kind of roadblock in my abilities, and that lack of self confidence issue I struggle with seems to take over. I try to convince myself that I really am making forward progress, and in some areas, I know that I am. But other areas….not so much as I would like.